East Renfrewshire Council has secured a range of community benefits as part of Morrison Construction’s delivery of the Greenlaw Business Centre in Newton Mearns. Four jobs, two apprenticeships, work experience placements and learning opportunities for schools are just some of the community benefits from the Glasgow City Region City Deal-funded project. The council is working in partnership with Morrison Construction and Clyde College to support two fully funded construction pre-apprenticeship courses. 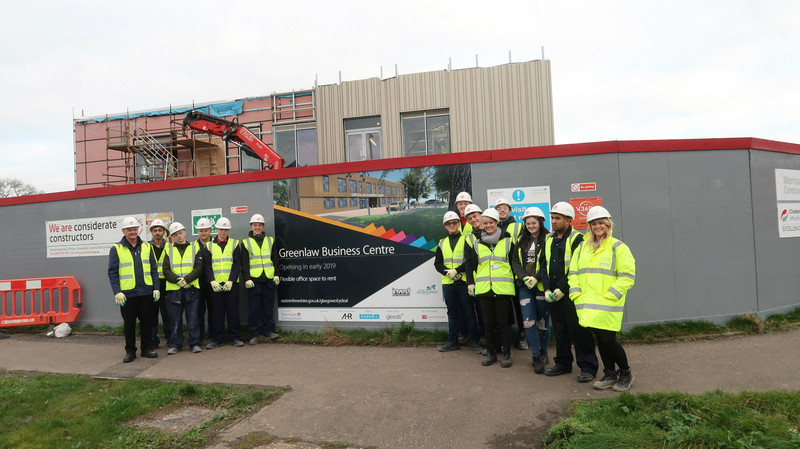 Students recently visited the Greenlaw Business Centre site and learned about the range of careers available in the construction industry. Former Williamwood High pupil Sam Paterson, 16, is attending the Clyde College course. Council leader Tony Buchanan said: “I’m delighted with the jobs, apprenticeships and skills development activities we have secured for our local community with contractor Morrison Construction. “Through supporting this Clyde College course and getting our young people out on site to see the build in action, we hope to help and inspire them to consider the different career opportunities in construction. “Greenlaw Business Centre forms part of a range of ambitious projects for East Renfrewshire made possible thanks to our £44 million Glasgow City Region City Deal investment. Greenlaw Business Centre is being built adjacent to the existing Greenlaw retail and commercial centre. Expected to be completed by spring next year, the facility will provide modern office accommodation in up to 36 small suites over two storeys. Caitlin Quinn, assistant community skills manager at Morrison Construction, said: “It is wonderful to know this partnership has directly benefited the community by supporting jobs, apprenticeships, work experience placements and building relationships with local schools. As part of the £44 million Glasgow City Region City Deal investment in East Renfrewshire, plans are underway to improve the road network between Barrhead, Newton Mearns and the M77, create a new train station in Barrhead and transform Dams to Darnley Country Park into a leisure destination.